The conversation/fallout continues from last week's City Council approval of the the mayor's plan for the Union Square Tech Training Center (aka tech hub) at the former P.C. Richard site on 14th Street at Irving Place. 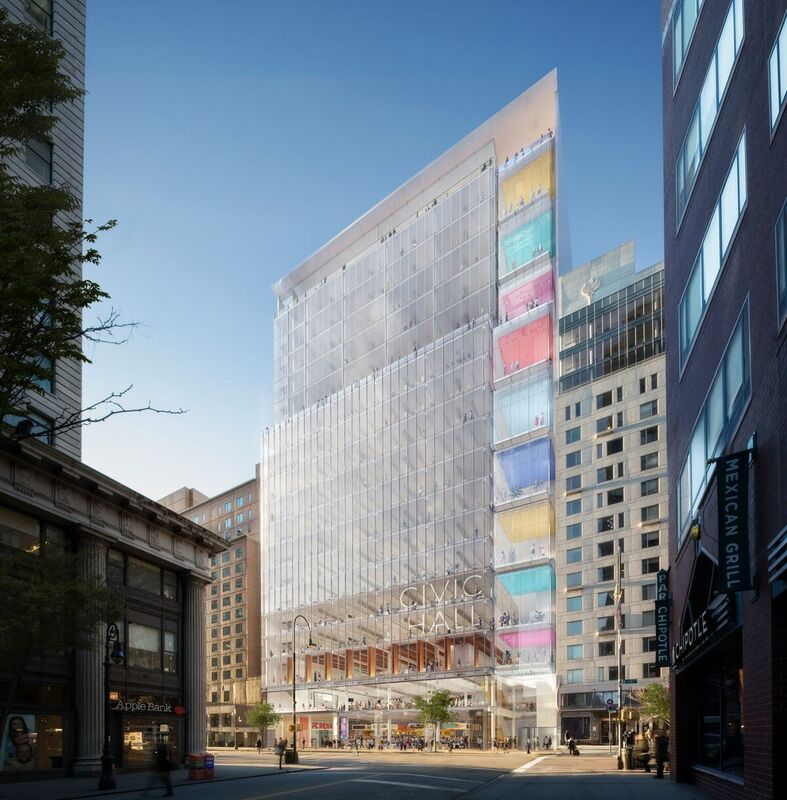 The unanimous approval includes the rezoning required to build the the 21-story tech hub — which is larger than what current commercial zoning allows. 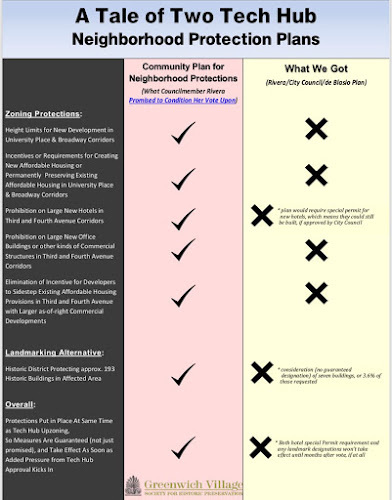 For months, some residents, activists, small-business owners and community groups expressed concern that the rezoning necessary for the project would spur out-of-scale development on surrounding blocks. The project is being developed jointly by the city’s Economic Development Corp. and developer RAL Development Service. The 240,000-square-foot building includes Civic Hall, which will offer tech training for low-income residents, as well as market-rate retail and office space. The support of local District 2 City Council member Carlina Rivera was key to making the tech hub a go, as Crain's other other media outlets noted. Rivera had reportedly promised to seek a separate rezoning for the surrounding area during her campaign last year to establish height limits and, in some cases, cap commercial square footage in exchange for her support of the hub. In voting yes on the project, Rivera said the tech hub would bring "true community benefits, tech education, and workforce development services that will finally give women, people of color, and low-income New Yorkers access to an industry that has unfairly kept them out for far too long." This link goes to the letter that Rivera shared following the vote. Meanwhile, the Greenwich Village Society for Historical Preservation (GVSHP), which had lobbied for protections for the surrounding neighborhood as a component of the tech-hub plan, released this statement from executive director Andrew Berman critical of Rivera's yes vote without any substantial zoning limitations. The GVSHP and other critics (the Met Council on Housing, the Historic Districts Council, the Lower East Side Preservation Initiative, the Bowery Alliance of Neighbors and the East Village Community Coalition were among the groups to express concern during the approval process) have said that the tech hub will provide important and valuable training services for low-income residents and small businesses starting out. However, Berman has pointed out that the training facilities could have fit in a smaller building on the site, which wouldn't require any commercial upzoning that only serves the mayor's real-estate interests. The requirement of a special permit for hotels will have little to no effect on the development problems the Tech Hub will exacerbate. First, any hotel can still be built with the approval of the City Council. Second, this really only applies to a portion of the affected area, since the zoning for about half the area already prohibits or restricts hotels. Third, hotels are only one of many forms of bad development this area is experiencing which this measure will not address, such as office buildings and high-rise condos, as well as doing nothing about affordable housing which the community rezoning plan Rivera promised to hold out for would have. Andrew Berman is a whiny baby that simply isn’t used to not getting his way. As a LES resident, I’m thrilled that my children will receive more opportunities to break into the tech sector and one day gain access to these job opportunities. Throughout this process, it was a vocal minority of old, angry, rich white people who were protesting against the tech hub (go look at the pictures of those holding signs on GVSHP’s own website!). Thankfully our community board and councilwoman were able to see past their hypocrisy. Anon @ 10:46am, What's hypocritical about wanting to preserve the current character and economic accessibility of the neighborhood through zoning protections while at the same time providing the community training and other benefits the hub promises? It did not need to be an all or nothing thing (Tech Hub without protections or nothing). As Mr Berman pointed out in his opinion piece on The Lo-Down, this same type of deal (rezoning with neighborhood protections) was done in the West Village at the end of 2016. You speak about rich people, yet without zoning protections, rampant development will make it such that those are the only people able to afford living in the neighborhood. I cannot see how Councilwoman Rivera can justify a seeming about-face on her position for zoning protections. I truly hope the community continue to press her on these issues, and her actions. And I pray that her (and Speaker Johnson's) position on the SBJSA doesn't also do a 180 when it comes up for a vote (hopefully!). "true community benefits, tech education, and workforce development services that will finally give women, people of color, and low-income New Yorkers access to an industry that has unfairly kept them out for far too long." Party line... One Party Rule pablum. She should never hold office. Her concerns for the welfare of her council district are questionable. She shows up for PS 64. Spreads that bull about taking it back. Then gives away zoning/development that will destroy a large part of her district. The question I'm confused about is: who does she work for? The Mayor. The Latino community? The real estate industry? Herself? But whoever/whatever she works for, it's not good enough. anonymous 10:46am - i am glad that "As a LES resident, I’m thrilled that my children will receive more opportunities to break into the tech sector and one day gain access to these job opportunities." and hope that there will still be some affordable apartments for your children to live in. and cmarty, there is no guarantee that the "services" you suggest are "true community benefits, tech education, and workforce development services that will finally give women, people of color, and low-income New Yorkers access to an industry that has unfairly kept them out for far too long." are not an obvious need for the union square area - especially when you consider that there will be no restrictions on what will be built and how dense it will be, or how affordable the apartments or stores will be. an even more critical neighborhood need as current development displaces so much. as far as our councilwoman's vote of yes, what it did was weaken her ability for any compromise or negotiating. nothing is written into the hub proposal that protects the neighborhood, citizens, or taxpayer. rezoning is the new reward to developers at the expense of the entire city. 10:46 am: I know that 3 if 21 floors will be for tech training. Can you please provide us with other details, including the number and types of jobs that will be trained for, funding and costs, educational prerequisites, application and selection process, and job placement goals and strategies. Since the training is such an important part of the Tech Hub I expect that this has all been considered and planned. And since you are such a fan I expect that you have more detailed knowledge than the rest of us. I mean you're not just relying on vague promises, are you? "women, people of color, and low-income New Yorkers" is just standard meaningless buzzword soup. A tech hub won't help any locals over any employment barriers in tech. Because the tech industry is already here and if they're gonna hire, they're gonna hire. Rivera, like the Mayor, plays the diversity card and then does nothing, which was always what was going to happen. What should be there? Another discount shoes outlet? A glass and steel condo building? Build some bespoke old style brownstones and distribute the ensuing 16 rent regulated apartments by lottery? Here's an idea: Make another speech about women, people of color, and low-income New Yorkers and then get on with building. I don't know if Anon @10:46 is mouthing a party line; but there is a genuine opinion there about the future needs of the city. The go to mantra for everyone who posts here is "affordable housing." If we do this, we will kill the stock of affordable housing in the surrounding area. I passed the PC Richards / Tech site this morning; the talk about restricting the height of buildings? Alongside the two mindlessly uninteresting NYU dorms nothing can do further harm to this block. Of course it is going to be an ugly building because to invite an architect like Renzo Piano to do an interesting building would increase the cost. I don't know if children in the EV /LES are going to benefit from this tech hub, but I am convinced that aside from a few give backs when the final design is published, this is a foregone political and economic decision. I noticed, too, that on the signage for what was Blatt Billiards, is #siliconvalley. The future is here. I don't believe the tech hub and whatever training it provides will arrive in time to truly benefit the community. The future was ten years ago for tech and it certainly doesn't require this late arriving giant tower.